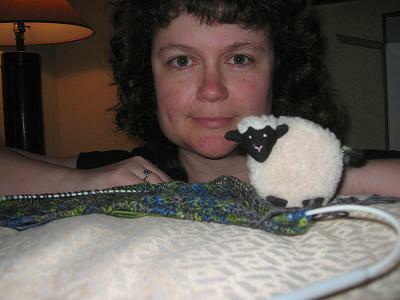 We Heart Yarn: Baa Baa McGee Reporting from Phoenix, Arizona on the newest contestant in the Amazing Lace! Baa Baa McGee Reporting from Phoenix, Arizona on the newest contestant in the Amazing Lace! 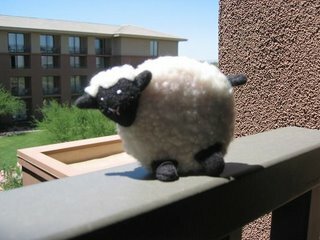 Baa Baa McGee reporting here from the sunny desert hills of Phoenix, Arizona. 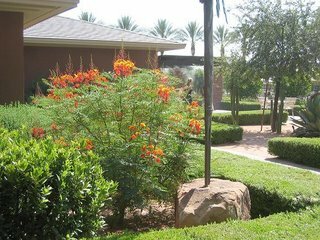 I'm here at the Westin Kierland Resort, surrounded by oversized cactus plants, fresh budding lime trees, and the scent of rosemary and sage continuously lingering in the air, and I'm highly determined to track down the newest contestant in the Amazing Lace....Wool Girl. We just received word that Wool Girl would be joining the Amazing Lace, along with a secret teammate, and wanted to be the first on the scene to get the scoop, the full scoop, and nothing but the scoop. Before we begin, though, let me introduce my colleague, and most trusted wool source, Kitty McGillicutty. 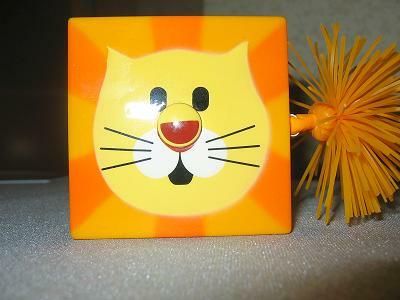 Kitty is a top notch reporter in the land of knitting and always seems to "measure up" the story each and every time. 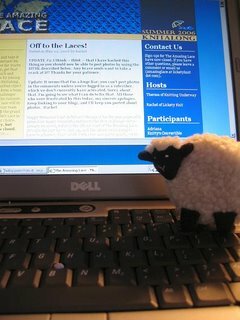 Kitty, can you give us a few words on the wearabouts of Wool Girl, and what we might be able to expect from her in the Amazing Lace this year? Hi Baa Baa. Always good to see you and glad to be working with you on this story. 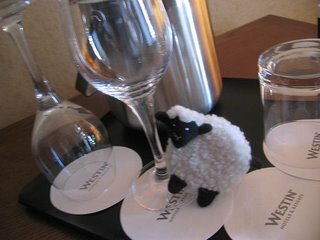 I just arrived in Phoenix this morning, hoping to catch a glimpse of Wool Girl as she checked into the Westin Resort, but with the crowds and heat, it's been pretty difficult. As you know, Wool Girl is originally from Portland, Oregon, and is part of the We Heart Yarn dream team there. 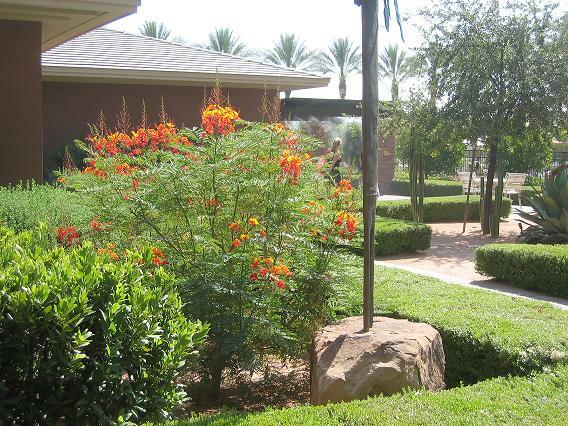 She travelled to Phoenix this week to take part in an MS conference, so we thought we would take this opportunity to catch her in prime knitting action whle she's listening to some workshops or lounging by the pool. So far, it's been next to impossible, as Wool Girl seems to be pretty persistent about avoiding the cameras. Thanks for the report, Kitty. 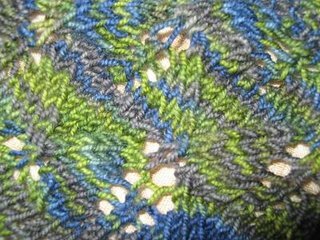 Any thoughts on what project Wool Girl might be working on for the Amazing Lace, and who her teammate might be? Not yet, Baa Baa. We've had our most trusted reporting team trying to get a sneak peak, but just haven't been able to do so yet. We'll keep you updated. Thanks Kitty. I'll check back with you later. (Knock, Knock, Knock!) 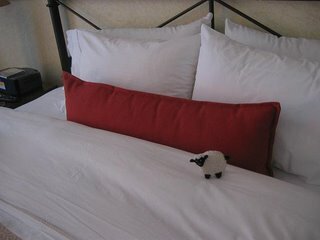 Baa Baa knocks on Wool Girl's hotel room door. There is no answer. Baa Baa slowly turns the knob on the door, finding it unlocked, much to his suprise! I can find out while I'm here. no sign of Wool Girl or her teammate. has been on the internet, planning out her secret Amazing Lace strategy! Let's check in with Kitty to see if she has any updates...Kitty? Hi Baa Baa. 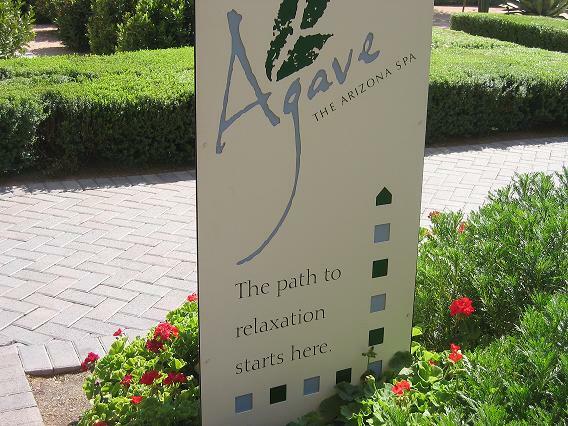 I'm standing at the entrance to what is called the Luxury spot of this resort, the Agave Spa. We have received reports that Wool Girl was spotted here just minutes ago. 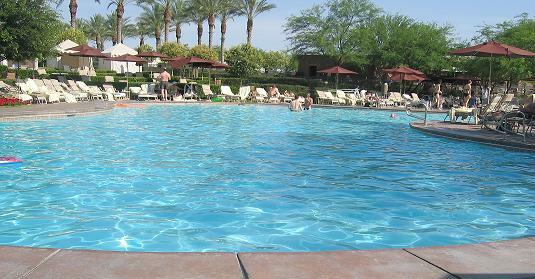 Let's head over to the spa and pool to find out. Looks like no sign of Wool Girl here at the pool or spa, Baa Baa. Must have been a faulty source who reported Wool Girl was just here. Very disappointing news. How are things going in Wool Girl's room? 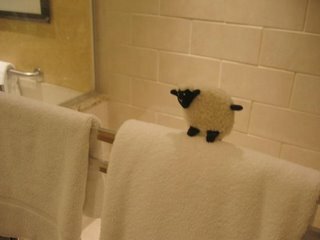 Any more clues to her whereabouts, Baa Baa? Well, Kitty, I'm standing next to what looks like a wine glass in Wool Girl's room, and apparently it has recently been used for drinking wine, but our experts are checking that out. It looks like we're very close to determining where Wool Girl is. Just then, the door to the room opens, and Wool Girl walks in, suprised to see a group of reporters, led by Baa Baa, in her room. But, she has been interviewed by Baa Baa in the past, and is not at all suprised that he has snuck in her room to get the entire scoop on this story. She agrees to interview with him briefly about her Amazing Lace debut. Breaking News! Just moments ago, the famous knitter Wool Girl let us into her hotel room in the luxurious Westin Resort. Wool Girl has decided to enter the Amazing Lace this summer, and we thought we'd get the entire story for all of the dye hard knitters out there. So, Wool Girl, tell us what you've decided to work on for the Amazing Lace this year, and who this, so called, teammate of yours is. beatiful and talented Lagoon Socks that Rock lightweight100% Superwash Merino. We bumped into one another one afternoon, by mistake, actually, and haven't been able to part since. Her colors are just exquisite, and she makes such a statement with everything she does. I couldn't not choose her for this adventure - it just wouldn't have seemed right somehow. 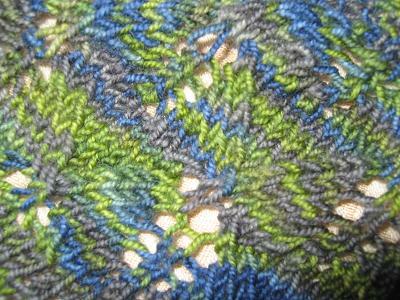 The project we'll be working on is the ever popular Kiri shawl from the All Tangled Up website. 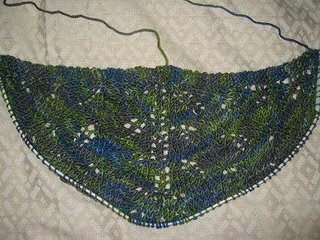 Kiri holds a special place in both my heart and in Lagoon's heart, as we started her last fall, and weren't able to finish due to other knitting committments. We both have been longing to work together on this project ever since, and this is such a great opportunity to do just that. This is great news, Wool Girl, as I'm sure knitting fans out there will be excited and anxious to see the progress from you and Lagoon this summer. Do you think Kiri would mind taking a pose for us in the state she's in? I realize she's only just begun, but we'd love to catch a glimpse of her anyway. Wool Girl quickly converses with Kiri about posing for the camera. Kiri is fine with that Baa Baa. Just as long as you get her good side. She's very touchy about making sure you get her good side. Baa Baa is very excited, as Kiri enters the room. They spend a few moments taking the picture of Kiri. Ok, Wool Girl. We've really appreciated you taking this time to answer our questions about the Amazing Lace, and again, we all look forward to seeing you and Lagoon in action. Just one more question, though. I know how much you do not want to be in front of the camera, but I do hope that you will consider posing with me for the camera, as I really am a fan of the We Heart Yarners, and would love to have a photo just for myself. Wool Girl smiles, in her shy way and poses for the camera. Only for you, Baa Baa, only for you! Awesome introduction WG....Kiri is indeed gorgeous. Baa Baa photographed her good side, indeed!! OMG, Wool Girl! You must be having the best time. What a great idea for an intro. You rock!